Can speak time in either 12 or 24-hour format. Ultra-slim, with attractive silver finish, small digital display screen, and durable metal keychain. Features clear, easy-to-hear female voice. Uses 2 AG13 button cell batteries (included). Measures about 2-1/2 in by 1-1/2 in by 1/2 in. 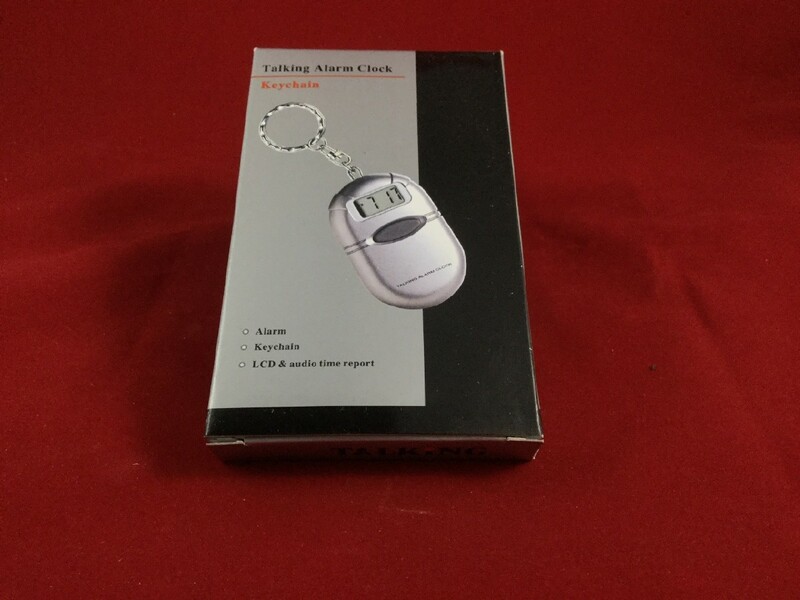 Because of its great low price and practicality, our Talking Key Chain Clock is an all-time bestseller. 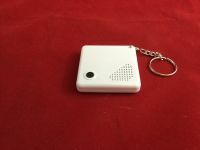 Small enough to conveniently fit into your pocket or purse, yet large enough to keep you from misplacing your keys, this ever-useful clock/keychain has a surprisingly loud and clear voice that's audible even in a noisy public place. Simply touch the large button on the front to hear the time announced in a pleasant, female voice. Or, choose to have the key chain speak the time every hour on the hour, just to be sure time won't fly by too fast. You'll also enjoy the easily-set alarm to wake you or remind you of important appointments with a beeping reminder of the time. 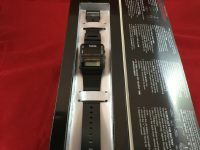 You can even set it to speak the time in either 12-hour or 24-hour military style. Directions for the Talking Keychain Clock From Future Aids, The Braille Superstore. 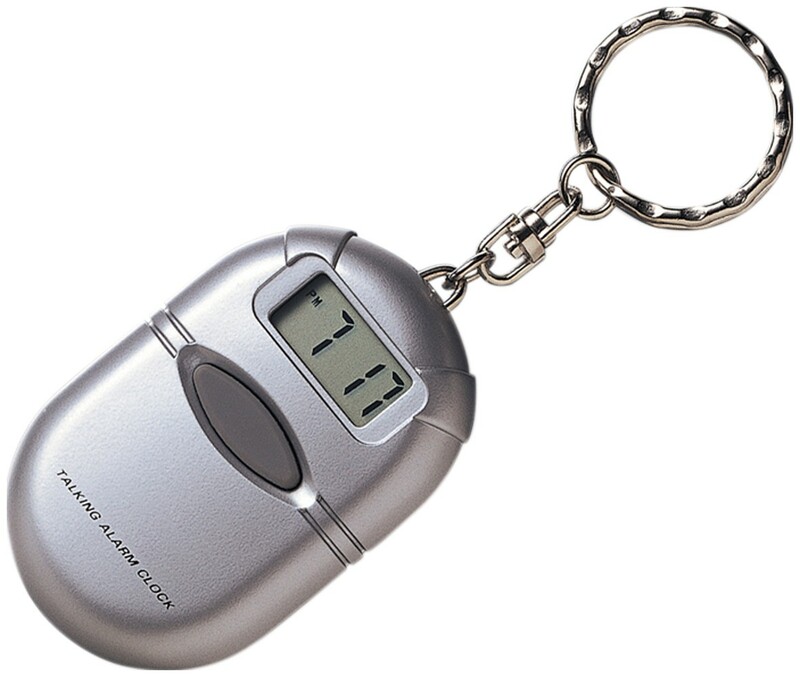 Place your talking pocket clock in front of you, with the metal keychain facing straight ahead. Now, be sure to have the side with three small buttons up. To select time announcement, press Mode until a single beep is heard. Press Hour for 12-hour announcement, or Minute to select 24-hour time. To set the time, press Mode again, and Time Set is heard. Just press the Hour and Minute buttons until the time is set correctly. To set the alarm, press Mode again and you will hear Alarm Set. Then, just as before, use the Hour and Minute buttons. To return to regular operation, press Mode one final time--and you'll hear four confirming beeps. Press Hour to turn the Alarm on or off. The clock will either say Alarm On, Snooze On, or Alarm Off. Lastly, to turn Hourly Announce on, press the Minute button and listen for five beeps. To turn it off, press Minute again, and you'll hear only one beep. And of course, whenever you want to hear the time, just press the large button on the opposite side of the keychain.